Great bass tones with practice-level power. 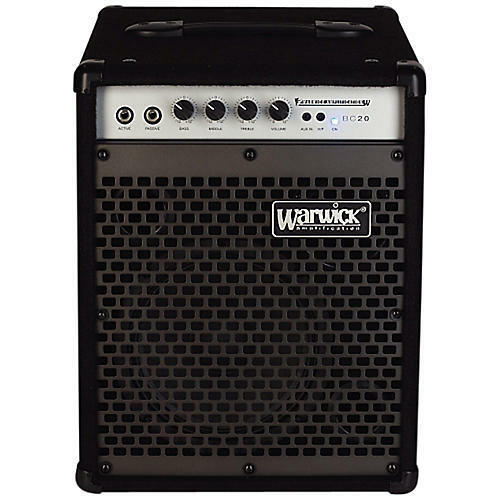 The Warwick BC20 20W 1x8" is a great option for bassists looking for a first amp or a great-sounding alternative for bedroom or backstage practice. It features a three-way EQ, DDL (Dynamic Distortion Limiter) for distortion-free play at high levels, and two instrument inputs for active or passive basses - and it's suitable for two instruments to play through at the same time. For practice-friendly features, the BC20 houses Aux. input to play along with a CD, MP3 or other media player, and a headphone output for silent play. Dimensions: 12.2" x 15.3" x 14.5"
Make great music without annoying the neighbors. Order today!